We are delighted to offer guided recce weekends for three of the Salomon Skyline Scotland™ race routes in 2018. Each recce will be led by a professionally qualified guide who also has first-hand experience of the event so that you can be assured of a safe, high quality experience with someone who is extremely knowledgeable about the event and the route. Typically, each guide has either worked on the event and/or raced in previous years. These recces are not races, and the intention is to travel at a comfortable speed for the group with time for chatting with each other and the guide. Your expectation should be brisk uphill walking, jogging on the flats and downhill running. You’ll need to come prepared for a big day in the hills with your own clothing, equipment and food. Our guided recce weekends of the Salomon Ring of Steall Skyrace™ and Salomon Ben Nevis Ultra™ are led by Summer Mountain Leaders with a maximum group ratio of 1:10. The Salomon Glen Coe Skyline® recces are led by a Mountaineering Instructor Award (MIA) or Mountaineering Instructor Certificate (MIC) qualified leader with a maximum group ratio of 1:5. You do not need to have an entry to participate in these recce weekends, but you do need an appropriate level of fitness. If you are joining the Salomon Glen Coe Skyline® recce weekend, you will also need to have some basic rock climbing and/or scrambling experience - this recce weekend is not for novices as you will solo climbing on the rock sections. 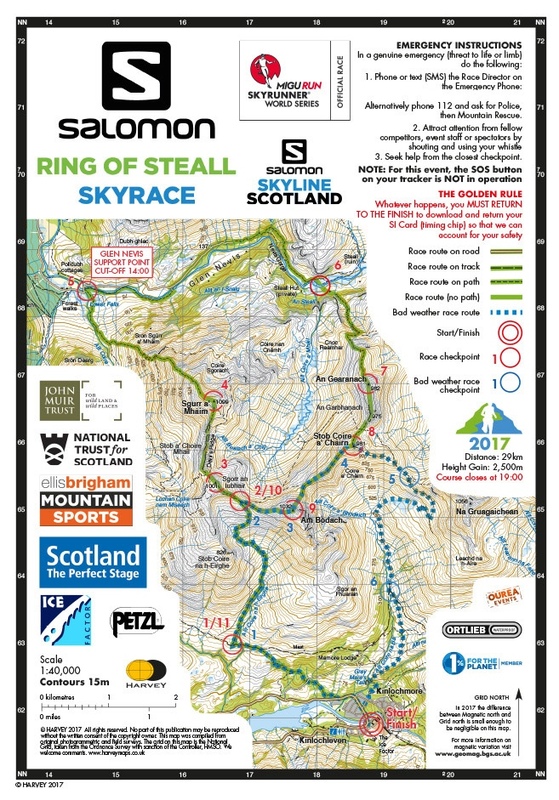 Salomon Ring of Steall Skyrace™ 2017 Map. Recces of the Salomon Ring of Steall Skyrace™ start and finish at the Ice Factor in Kinlochleven, and follow the epic race route in full over one exhilarating day. The group will meet at 09:30 in the Ice Factor Café, and set off at 10:00. This schedule mirrors the exact start time of the race, which means that whilst getting to know the route, you also get first-hand experience of how you are moving relative to the 14:00 cut-off at CP5 in Glen Nevis. The group will finish back at the Ice Factor in order to give you an opportunity to satisfy cake and caffeine cravings. The Salomon Ring of Steall Skyrace™ race route is approximately 29km with 2,500m of ascent. Because of the re-designed route for the 2018 Skyrunning World Championships the race map is not yet available. Recces of the Salomon Glen Coe Skyline® are split over two days. On the Saturday, the group meet at 07:30 at CP1 in Glen Coe and set off at 08:00 (parking is available here). This mirrors the slower schedule of runners on the course from previous years. This means that whilst getting to know the race route, you also get first-hand experience of how you are moving relative to the 15:00 cut-off at CP11. The Saturday recce takes in Curved Ridge and all the summits on the south side of the iconic Glen Coe, before finishing at CP11 in the late afternoon. It is a very challenging and memorable day in the mountains yet is only half the race route! We provide return transport to CP1 at the end of the day so that you are quickly returned to your vehicle. The Sunday recce starts by meeting at CP11 at 09:00 and setting off at 09:30 (parking is available here). On the second day, the recce includes the famous Aonach Eagach, before following the race route across all the summits on the northern side of Glen Coe and joining the excellent trail running on the West Highland Way descending into Kinlochleven, and a welcome break in the Ice Factor café! We provide return transport to CP11 to meet your vehicle. Please note that this guided recce does not include the section between CP15 and CP1; a few kilometres of the outward leg soon after the start. 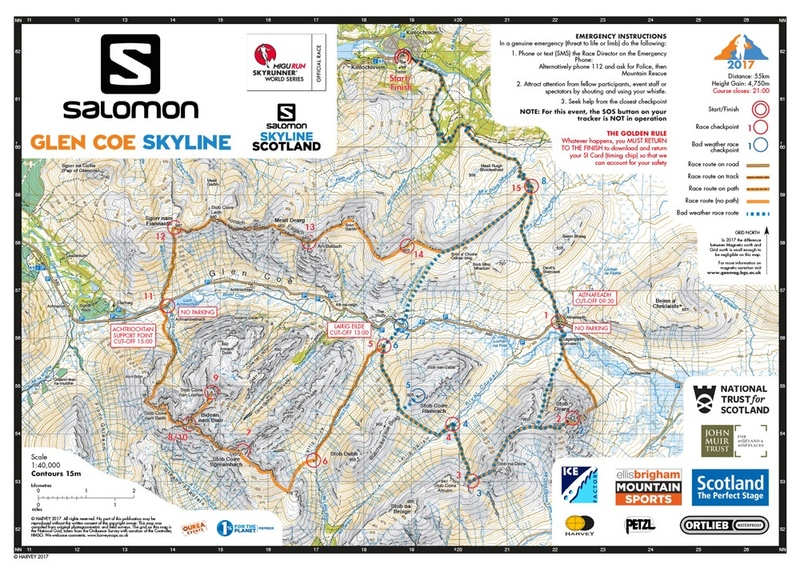 The Salomon Glen Coe Skyline® route is approximately 52km with 4,750m of ascent. Day one of the recce is approximately 35km, and day two of the recce is approximately 20km. The cost of joining this guided recce includes transport on both days.